I am not a "huge" fan of Glock, and originally wasn't when I started a shooting hobby. However, the more I shoot, the more I like Glock, and my Glock 48 was not exception. I bought this on shear brand reputation and how it felt in my hand at the store. It was a bit of a risk for me especially a gun just recently introduced. But I own a Glock 43 and like that too, and the 2 are related so I took the risk; and I am glad I did. I took it out for the first time, and the things I noticed most was...nothing. I did not pay any attention to it's shooting, it's recoil, it's handling and fit, because it all felt so natural. I just shot, and it was comfortable and fun. Recoil was more than manageable, better than my Glock 43. The best praise I can offer a gun is one that doesn't require me to pay attention to how I shoot and just lets me shoot and not have to adjust or compensate for something. It all felt 2nd nature. I would absolutely recommend this to a friend or anyone else looking for a comfortable and reliable shooter, something concealable without sacrificing caliber and low round count. 10+1 is not bad, and that is your max count in some states anyway. 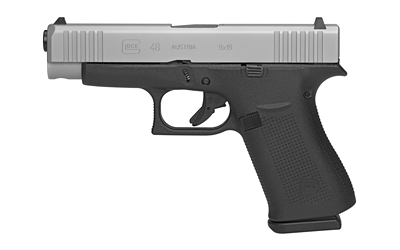 The Glock 48 must absolutely be considered for anyone's next pistol purchase. I hope this helps, or even convinces someone to buy one.